I handle these records on a regular basis, and this is the best One I have had in over Two years. Cost will vary depending on location. 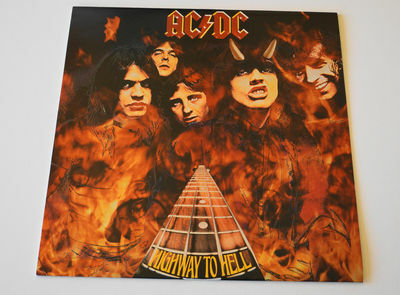 Country: Released: Genre: Style: Tracklist A1 Highway To Hell 3:26 A2 Girls Got Rhythm 3:23 A3 Walk All Over You 5:08 A4 Touch Too Much 4:24 A5 Beating Around The Bush 3:55 B1 Shot Down In Flames 3:21 B2 Get It Hot 2:24 B3 If You Want Blood (You've Got It) 4:32 B4 Love Hungry Man 4:14 B5 Night Prowler 6:13 Companies, etc. Made By – Phonographic Copyright (p) – Copyright (c) – Recorded At – Mixed At – Credits Art Direction – Bass – Drums – Engineer [Assistant] – Engineer [Recording] – * Guitar – , Mixed By [Mixing Engineer] – Photography By – Producer – Vocals – Written-By – *, *, * Notes First pressing with Blue Alberts label. Recorded at Roundhouse Studios, London. Mixed at Basing Street Studios, London. Made by E.M.I. (Australia) Limited, Sydney, N.S.W. (C) 1979 J. Albert & Son Pty. Ltd.
A few words about condition. Mint is a Rigid Band - The next Four Grades are all Narrow Bands, that slightly widen as the condition gradually deteriorates - Good is still Good, but there is a rapid widening of the Grade Bands, as the condition deteriorates over the last Four grades. The record itself is in brand new condition with no surface marks or deterioration in sound quality. The cover and any extra items such as the lyric sheet, booklet or poster are in perfect condition. Only graded on records that are sealed or clearly unplayed. The record shows virtually no signs of having been played, there is no lessening in sound quality. The cover and packaging might have the slightest of tiny defects. The record shows some slight signs of having been played, but there is very little, (if any) lessening in sound quality. The cover and packaging might have very slight wear. The record shows signs of having been played, but there is very little lessening in sound quality. The cover and packaging might have slight wear, light creasing. The record has obviously been played many times, but displays no major deterioration in sound quality, despite noticeable surface marks and the occasional light scratch. Normal wear and tear on the cover or extra items, without any major defects. This is an above average used record, that has been well looked after. The record has been played so much that the sound quality has deteriorated, but the record will still play through, and it will not be a completely unpleasant listening experience, even at the bottom of this grade (56). The cover and contents may suffer from folding, scuffing of edges, spine splits, discolouration, etc. The record is still playable but has not been cared for properly and displays considerable surface noise; it may even stick, skip or jump.. This is starting to be an unpleasant listening experience at the top of the grade (55) and will not be a pleasant listening experience at all by the end of it (41). The cover and contents will be torn, stained and/or defaced. The record will not play properly due to scratches, bad surface noise, etc. The record is unplayable or might even be broken, and is only of use as a collection-filler. The Sleeve is non existent (0) or what is left, is only just recognisable. Johnny Paycheck - The Lovin Machine US ORIGINAL 1966 - STILL SEALED !! Johnny Cash - The Original Sound O Johnny Cash US ORIGINAL - MINT !! Johnny Cash - SIngs Hank WIlliams US ORIGINAL - TOP-COND ! !